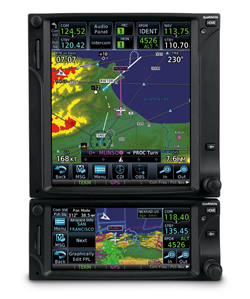 Garmin has introduced a variety of new products with touchscreen capability not only for panel mount but also portable this year that are a great addition to existing avionics packages or a complete upgrade to your panel. If you would like more information on any of their products or are interested in having them installed, please email us. Below are just a brief overview of their versatile products. News: We have software version 5.20 Main & 5.0 WAAS for the GNS-400W/500W series equipment. Version 5.20 adds the capability to interface your GNS-530W/430W to a Flightstream 210. Contact us to schedule your update today. 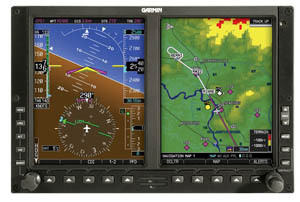 G600/G500 combines critical flight data and displays it on two 6.5 inch diagonal flat-panel LCDs. These high resolutions screens are mounted side by side in a single bezel that fits neatly into the “six-pack” slot in your instrument panel. They feature brilliant color and advanced backlighting, so you can view images in sharper detail — even in direct sunlight. 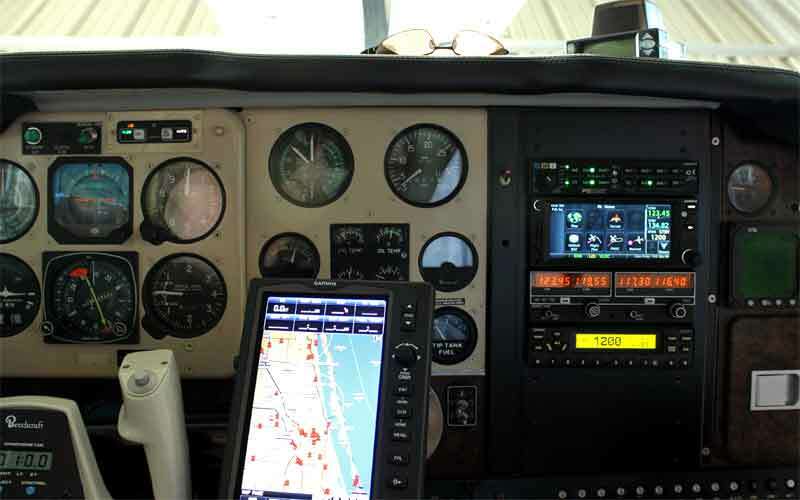 On the left-hand side, the PFD seamlessly integrates all situational information regarding your aircraft’s position, speed, attitude, vertical rate, altitude, steering and flight progress. On the right side, the MFD provides detailed moving-map graphics of your aircraft’s current position in relation to ground features, chart data, navaids, flight plan routings and more. The GTN family makes it easier than ever to get where you’re going. Graphical flight planning capabilities allow you to preview your entire route on the map screen and easily enter new waypoints or modify existing ones. The system even lets you load Victor and jet airways. A handy "rubber band" feature lets you grab any leg of your flight plan route and move it to accommodate a deviation or ATC amendment to your flight plan. The GTN 750 also allows you to enter your most recently visited or nearest airports as waypoints and “Direct To” destinations. Built-in Garmin U.S. FliteCharts™ or optional Jeppesen®-style geo-referenced ChartView™, provides you with approach plates and procedures, while Garmin SafeTaxi® lets you see geo-referenced runways, taxiways, FBOs and hangars. Garmin has provided us with a comparison of the GTN & GNS series products. If you have been trying to decide on whether to upgrade, this pdf explains the primary differences between the two product lines. Also, if you have a 28v GNS Series that is in need of repair, it is no longer repairable and upgrading to the GTN series is a option to consider rather than searching for a used GNS. 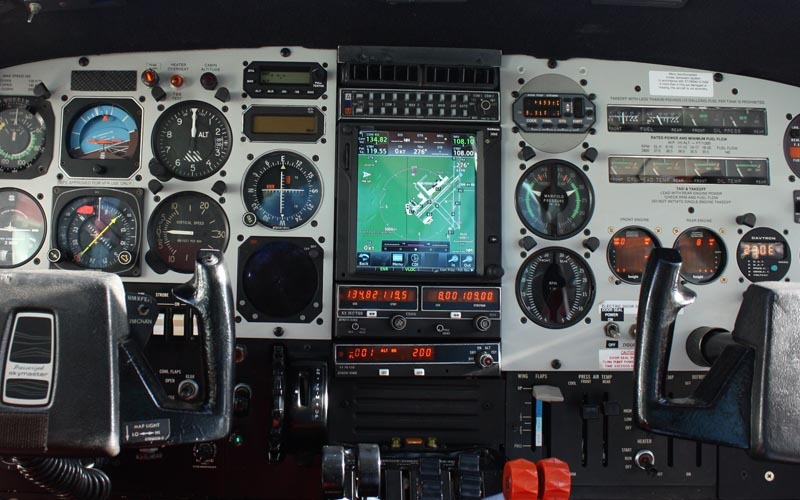 The first truly all-digital audio panel, the GMA 350 introduces a number of new technologies to the cockpit, including Telligence™ Voice Command, 3-D audio processing and advanced auto squelch. As compact as it is capable, the GNC 255 can bring powerful Nav/Comm capabilities to virtually any cockpit. Not only does the GNC 255 meet the basic needs of most pilots – including adhering to new airspace requirements in Europe – it also features a number of advanced features that save you time and effort. It also contains an internal VOR/LOC converter and 40-channel glideslope receiver. The panel-mounted GTX 327 is a TSO-certified Mode C digital transponder. Its innovative features, proven performance and reliability bring a whole new level of transponder utility to your aircraft. GTX 327 features a solid state design, and with no warm up time, lower power consumption and much lower heat emissions, you’ll enjoy a longer service life. It provides 200 watts nominal power output and has an easy-to-read DSTN liquid crystal display which reverses the numbers out of black for optimal viewing. An innovative keypad makes entering a squawk code a snap, and a dedicated VFR button allows for quick-and-easy VFR squawking. Similar to the GTX 330 Mode S transponder, the 327 also offers several timing and display functions, including flight time, count-up and count-down timers, as well as current pressure altitude. All product images and information courtesy of Garmin Ltd. For more information please email.